Bed bugs…you have probably heard of infestations becoming more rampant in recent years throughout Arizona and most of the U.S. Although they don’t spread disease, these pests are very hard to get rid of and come from almost anywhere including hotels, theaters and even clothing stores. The best defense is to avoid bringing bed bugs home with you altogether. Once they set up shop in your house it is extremely difficulty to clear out bed bugs without professional pest control treatments and sometimes it can be very costly. So to help you know bed bug signs, especially for all Arizonans going on vacation, here are some tips to keep them from hitching a ride back home with you. Anytime you go on vacation it is important to check the room before you unpack and settle in. National Geographic reported that bed bugs can bite 500 times in one night! Can you imagine waking up on your first day of vacation with red marks on your arms, legs or other exposed areas. Some people have allergic reactions to the bites with severe itching so for these reasons take these steps once you check-in. Be sure to pull back the bed sheets to look for the actual bed bug itself, the adults and eggs are visible to the naked eye. See if there are any small blood spots on the sheets or at the mattress seams and corners of the bed. If you see any type of stain, speak to the management and move rooms to a different part of the hotel because bed bugs can travel through the walls and electrical sockets so rooms that are close may be infested as well. If you inspect the other room, including behind the bed, the furniture and the carpet and you find the same signs of bed bugs you may be safer moving to another hotel. Another helpful precaution during vacation is to keep your belongings all together and in your suitcase. Some travelers even report keeping their suitcase in a closed plastic bag or storing it in the bathroom where bed bugs are less likely to be found. These measures will hopefully help keep you and your family bed bug free! Even when you take precautions and check your hotel room closely for bed bugs they can still come home in your suitcase or on your clothes and as mentioned above, could be from sitting in a theater or buying infested clothes. So, as soon as you return home it is a good idea to vacuum suitcases or use a hand garment steamer to clean them and if possible, store luggage outside in a garage or storage room. Bed bugs feed off human and sometimes animal blood so the bedroom is a prime place for them to do this. Therefore, it is also important to wash all clothing, even things you didn’t wear, in hot water to make sure you eliminate any bed bugs lurking there. This will help steer clear of an infestation in your closet or drawers which can lead to your bed. The downside is that bed bugs can live for months or even years without feeding and of course they keep reproducing. Unfortunately, these hearty creatures are also very small and flat so they fit into tiny places that you may not even think to look. If you do find bed bugs or possible signs of bed bugs in your home all hope is not lost. It may be a bit stressful and frustrating but your persistence and the dedication of your local pest control company will ensure the bed bug problem is solved. Always be sure to call a trusted pest control professional when dealing with bed bugs because it takes the use of multiple methods to kill them all. More than one visit and alternating treatments may be necessary depending on the extent of the bed bug infestation. As frustrating as it can be to get bitten night after night, it is never a good idea to take matters into your own hands because you may cause harm to yourself. There have been reports of people putting rubbing alcohol, paint thinner or gasoline on the edges of their mattress (these are all very flammable) or even spraying pesticides on their bed which should NEVER happen. Let the professionals assess the bed bug issue and provide you with the right solutions! We truly hope you never have to deal with a bed bug infestation because of the time and effort that it takes to rid the entire house of them. But remember, that’s what we are here for and our professional technicians would rather apply appropriate treatments over time than have you try the ‘bed bug remedy’ you found online that may not be safe. 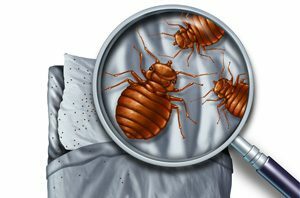 So if you are ever in need of a bed bug inspection or have located a bed bug infestation, don’t hesitate to call us right away!